Om du köper detta objektiv följer det med ett motljusskydd, vars modellbeteckning är "ET-120". Text från Canon: "Detta är den senaste versionen av Canons berömda 300 mm objektiv med den maximala bländaröppningen f/2,8. Det nya optiska systemet med en fluoritlins och två linser av UD-glas eliminerar det sekundära spektrum helt och ger en fantastisk bildkvalitet. Både upplösningsförmågan och kontrasten är högre än förut, fastän de föregående versionerna redan var i absolut toppklass. Bildstabilisatorn gör det möjligt att använda cirka 2 steg längre slutartid än vanligt på fri hand. Autofokusen är extremt snabb tack vare en ringformad ultraljudsmotor och förbättrad algoritm för inställningen. Närgränsen har förkortats till 2,5 meter. Du kan alltid justera fokuseringen manuellt utan omkoppling av objektivet och det har också en förbättrad funktion för förinställning av skärpan och en ny funktion för stopp av autofokusen. Objektivet har låg vikt tack vare fattningen av AlMg-legering. Det är väl tätat mot damm och fukt och levereras med ett avtagbart stativfäste." Text från Canon: "Telephoto lens newly equipped with an Image Stabilizer enabling hand-held shooting for easier movement. The fluorite element and two UD-glass elements effectively correct the chromatic aberrations prone to occur with telephoto lenses. With the EOS-1v and EOS-3, the AF speed becomes the world’s fastest. To reduce the overall weight and enhance portability, the lens barrel and many other exterior parts use a magnesium-alloy. Also, the detachable tripod collar revolves smoothly and locks securely. 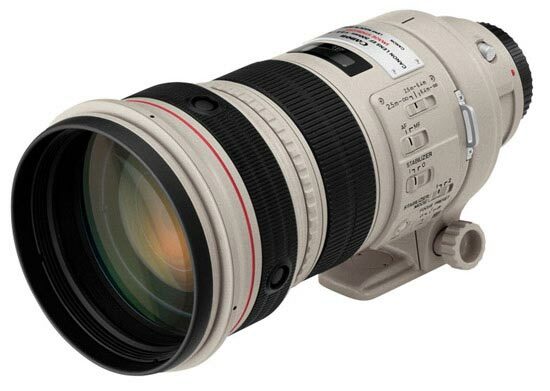 Large-aperture telephoto L lens with a camera shake correction function, which is best suited to shooting by holding the camera with hands Developed as a successor to the EF300mm f/2.8L USM. A fluorite lens and two UD lenses are used in the optical system to assure very high picture quality. This lens has also a protection glass and a rear filter as standard, which are included in the number of lenses. The camera shake correction has an effect of approx. two stops* in terms of shutter speed. This lens has also ”camera shake correction mode 2” which corrects shaking of the viewfinder image when, for example, shooting a moving object, and a tripod can be used with the camera shake correction function ON. High-speed autofocusing is achieved by the weight reduction of the group of focusing lenses and improvement of the autofocusing drive algorithm. A new AF stop function, which stops autofocusing temporarily, is adopted. Manual focusing is performed mechanically to save power. Main components are made of a magnesium alloy to reduce the weight of the lens, including the optical system, making it much lighter than conventional lenses. Rubber parts are used as mount and switch components to achieve excellent dust- and drip-proofness. The tripod mount can be removed, and the drop-in filter 52 (standard), carbon fiber hood, and suitcase-type lens case are designed to be easy to use. Telephoto lens newly equipped with an Image Stabilizer enabling hand-held shooting for easier movement. The fluorite element and two UD-glass elements effectively correct the chromatic aberrations prone to occur with telephoto lenses. With the EOS-1v and EOS-3, the AF speed becomes the world’s fastest. To reduce the overall weight and enhance portability, the lens barrel and many other exterior parts use a magnesium-alloy. Also, the detachable tripod collar revolves smoothly and locks securely."